Stream the Film and Download the Discussion Guide Today! 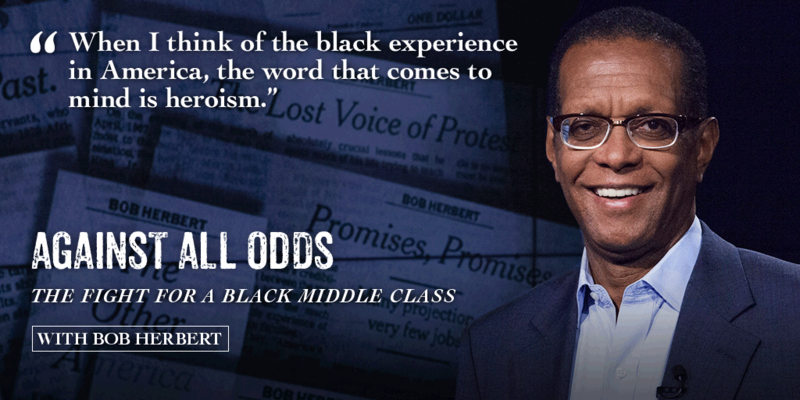 Stream AGAINST ALL ODDS: The Fight for a Black Middle Class with Bob Herbert and download your complimentary companion Discussion Guide today. Courtesy of Public Square Media, Inc., Bob Herbert, and BazanED, this film and Discussion Guide is for High School and College students, and features historical background and references to American History, African American History, Civil Rights, and Race in America. Within the guide, you will find digital assets to support your discussion including two links to stream the full film (a full 76 minute version and a condensed 56 minute version), video clips from the film, video interviews, digital photos and printed resources. ACTIVE STREAMING LINKS TO FULL FILM FOUND ON PAGE 7 OF THE DISCUSSION GUIDE. See Page 18 in Discussion Guide to request a complimentary DVD of the film. Viewings of this film and lesson plan discussion meet Common Core Standards. AGAINST ALL ODDS: The Fight for a Black Middle Class with Bob Herbert is a look at the extraordinary difficulty African Americans have faced in their efforts to establish a middle class standard of living. Through dramatic historical footage and deeply moving personal interviews, the documentary explores the often-frustrated efforts of black families to obtain the financial security that is enjoyed by white citizens. This is a film about historic, brutal, institutionalized racism – racism that has played out in the courtrooms, classrooms, financial institutions and communities of America for generations, and that established huge, almost wholly insurmountable barriers to success for African Americans in their pursuit of the American Dream. Journalist Bob Herbert interviews prominent African Americans, including Pulitzer Prize-winning journalist and author Isabel Wilkerson, Congressman Elijah Cummings, renowned psychologist and author Alvin Poussaint, Maya Rockeymoore, President of Global Policy Solutions, Marc Morial, President of the National Urban League, and policy activist Angela Glover Blackwell, among others, who share generational stories of profoundly damaging economic and social prejudice.